Travellers at Moscow’s Sheremetyevo international airport can now buy a model Kalashnikov assault rifle before they catch their flight. A Kalashnikov boutique has opened at Sheremetyevo to promote the world-famous Russian gunmaker’s brand. The shop’s souvenirs include camouflage gear and “I love AK” T-shirts. The AK-47 assault rifle has a worldwide reputation for reliability. The Soviet bloc countries, and many guerrillas, relied on the gun for decades. An airport official quoted by Reuters news agency said the model guns were clearly imitations and would not pose security problems. Sheremetyevo is Russia’s biggest international airport, and handled more than 31 million passengers last year. There is widespread international concern about replica weapons which can be mistaken for the real thing and potentially used by terrorists. A Russian state corporation, Rostec, owns 51% of the shares in the Kalashnikov concern, which makes the guns at Izhevsk, in central Russia. In 2014 the EU and US added Kalashnikov to their lists of Russian arms manufacturers subject to sanctions because of Russia’s annexation of Ukraine’s Crimea peninsula. The airport shop is part of the firm’s drive to expand its civilian merchandise. 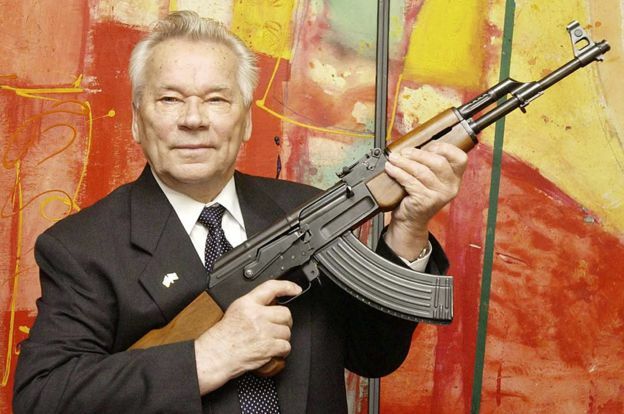 “Kalashnikov is one of the most popular brands that come to mind when people think of Russia,” said the firm’s marketing director Vladimir Dmitriyev, quoted by RIA Novosti news agency. BERLIN (Reuters) – The leader of the populist Alternative for Germany (AfD) party has spoken out in favor of people arming themselves with guns and self-defense devices following a series of violent attacks last month. The anti-immigrant AfD has won growing popular support in Germany due in part to Europe’s migrant crisis, which has seen more than 1 million refugees arrive over the past year, and it now has seats in eight of Germany’s 16 state assemblies. Petry rejected calls to toughen up gun laws, saying this would affect respectable citizens and not those who acquire weapons in the so-called “dark net“, which is only accessible via special browsers. Germany has some of the most stringent rules around gun control in Europe. Firearm owners must obtain a weapons licence for which applicants must generally be at least 18 years old and show they have they have a reason for needing a weapon. Nonetheless, sexual assaults on women in Cologne at New Year and three fatal attacks have added to the feeling of vulnerability and prompted Germans to stock up on scare devices. The number of Germans applying for so-called “small firearms license”, which are required to carry around blank guns and pepper spray, jumped 49 percent in the first half of 2016 to 402,301, according to federal statistics. India is seeking to boost arms exports 20-fold in a decade to $3 billion, a push that if successful would transform one of the world’s biggest importers into a major seller of defense equipment. Steps by Prime Minister Narendra Modi to spur defense manufacturing, if properly implemented, open up the possibility of hitting that figure by 2025, Defense Production Secretary A. K. Gupta said. The challenge is to boost private-sector investment and technological expertise, he said. “This will not only take us toward the goal of self-reliance in defense production, but will also create tremendous employment opportunities,” Gupta, one of the top bureaucrats in India’s Defense Ministry, said in the interview in New Delhi last month. India sells about $150 million of arms overseas yearly — a fraction of the $64 billion in worldwide defense trade — ranging from parts for Russia’s Sukhoi fighter jets to a naval vessel recently commissioned in Mauritius. The nation relies on strained state manufacturers that lack some of the expertise of global defense majors, signaling a need for more private-sector involvement even as companies are wary of difficult business conditions. The sectors where India has export potential include naval ships, helicopters and components for aircraft, according to consultant PricewaterhouseCoopers LLP. China’s defense exports reached $1.5 billion in 2014, the eighth-largest in the world in a ranking dominated by the $23.7 billion sold by the U.S., according to IHS Inc. research. India imported $5.6 billion, the most after Saudi Arabia. 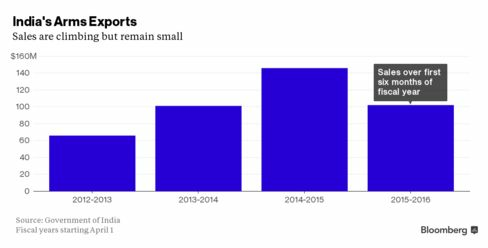 India estimates exports of materiel more than doubled over the two fiscal years ended March 2015 to 9.9 billion rupees ($145 million). Modi’s policy changes include fewer curbs on foreign investment in defense, looser export controls and a reworked procurement policy that’s set to encourage domestic output. His government has authorized about $65 billion of arms purchases since taking power in May 2014 and is targeting a major naval expansion with locally made ships. The administration is also sharing the blueprints of state equipment — such as theRustom drone — with the private sector for the first time, to spur technological development and possible overseas sales. Companies ranging from Larsen & Toubro Ltd., India’s biggest engineer, to Airbus Group SE sense opportunities from less onerous rules and the drive for modernization. Modi in April scaled back a long-pending order for 126 Dassault Aviation SA Rafale warplanes, which stalled partly because the tender included the challenge of making 108 of the complex jets at India’s state-run Hindustan Aeronautics Ltd. In the end, the premier opted for 36 Rafales from France in fly-away condition. France’s Safran SA subsequently shelved plans to make engine parts for Rafale aircraft in India. The episode shows the task Modi faces to catalyze a defense-industrial complex. State companies account for more than 80 percent of defense production and are already stretched, according to Anurag Garg, a director of defense at Strategy&, a consulting group of PwC. Depending on the private sector to spur exports significantly would need companies to design weapons systems to sell abroad, and that’s no easy task, he said. The government is trying to do its bit by improving the policy framework, but the push needs the support of industry, said Gupta from the Defense Ministry. “Industry also needs to come up and accept the challenge,” he said.